Author(s): Harvey Kaiser - Harvey H. Kaiser Associates, Inc.
Facilities condition assessment is the process of developing a comprehensive picture of physical conditions and the functional performance of buildings and infrastructure; analyzing the results of data collection and observations; and reporting and presenting findings. Data collection and analyses can inform decision-making for accessibility for the handicapped provisions, energy management, and sustainability. This chapter provides the tools needed to conduct a facilities condition assessment, guidelines to report assessment findings, and advice to present a persuasive case for the need to fund capital renewal and deferred maintenance. The main objective of the facilities condition assessment is to measure the condition and functionality of building and its infrastructure as suitable and appropriate for intended functions. Specific objectives of the comprehensive assessment methodology include determining needs for renewal or replacement of building and infrastructure systems (e.g., Heating/cooling, electrical, exterior envelope, etc.) and system components (e.g., cooling tower, heat exchanger, chiller, pumps, etc. ), and guiding the analysis of good decision capital project options, including renovation or modernization. Develop metrics for performance measures, e.g, Facilities Condition Index (FCI) and Facilities Quality Index (FQI). The traditional method of assessing existing buildings and infrastructure (commonly known as the Facilities Audit) is limited to physical deficiencies in building and infrastructure systems and subsystems, as well as necessary measures for compliance with applicable codes and conformance with the Americans with Disabilities Act (ADA). The methodology used in this chapter integrates the Physical Condition Assessment with a Functionality Assessment. The latter assessment comes from a user perspective, rather than from a building perspective, and is aimed at understanding how well the space functions, its suitability for its current (or other) purpose, and its potential for alternate uses. The physical condition assessment can be based on fully detailed inspections or on a predictive forecasting model based on life-cycle expectations, or on a combination of the two. Physical condition assessment methodology has advanced from manual data entry on inspection forms to sophisticated data-gathering and analytical techniques. A thorough physical condition assessment, based on building inspections and data collection from other sources (interviews with maintenance staff, maintenance records, and feasibility studies), permits detailed cost estimating and project scheduling. Thus, results of an assessment based on field inspections can be translated directly into projects and assembled for sorting into a capital projects plan. An alternative to comprehensive building and infrastructure subsystem inspections is a predictive model of capital renewal needs, usually for a minimum 10-year period using statistical methods. Forecasting is based on building system life cycles and remaining useful life-of-building and infrastructure subsystems (such as mechanical, plumbing, electrical, elevators, and roofs). The forecast produces a calculation of the scheduled year for system renewal and estimated renewal cost. The total cost to restore various subsystems when life cycles expire are calculated on an annual basis and can be averaged over a period of time to determine annual capital renewal expenditures. The relative cost of these two alternatives is an important issue in selecting a methodology. The two methodologies detailed condition assessment or predictive life-cycle modeling vary widely in cost and results. In 2015, the statistical life-cycle modeling technique is likely to cost less than 20 percent of performing a full-field inspection condition assessment. In addition, life-cycle modeling requires less time to produce findings, approximately half the time of a detailed condition assessment. Both techniques depend on in-house staff input to varying degrees. The experience of higher education institutions, public agencies, and the private sector is that a combination of the detailed condition assessment and predictive modeling addresses trade-offs in cost, delivery of findings on a timely basis, effective use of in-house staff time and knowledge of plant conditions, and data-updating requirements. Conversely, a relatively inexpensive and rapidly performed predictive life-cycle model is most useful for macro-level capital planning and budgeting. This model can provide cost estimates and schedules for capital major/maintenance needs and future facility renewal. Especially for an institution that has, or wants to establish, an aggressive annual capital renewal program, the predictive modeling approach calculates the stream of annual funding required to meet forecasted needs. On the other hand, the detailed condition assessment provides voluminous documentation for capital project justification and project planning. When a life-cycle predictive model is selected as the primary source for capital project planning, projects and estimated project cost should be verified by disciplined field inspection of a minimum of 10 percent of an institution's facilities. Senior Campus Administrators. The assessment supports a consistent presentation of facilities deficiencies, leading to better priority setting when funding is limited. Long-term capital budgeting and planning to eliminate deferred maintenance and maintain facilities in a functionally usable condition are served by the assessment. Governing Boards. The assessment provides information to governing boards concerned with the condition of buildings and infrastructure and the formulation of long-term capital project planning and adequacy of annual maintenance funding. Facilities Managers. The assessment will provide information for routine maintenance, preventive and planned maintenance, major maintenance, capital renewal, and renovation project planning. The inspection procedures and forms can implement a routine process for observing deficiencies and incorporating them into maintenance planning. The facilities assessment will help the facilities management staff communicate with the administration; facilities problems that were avoided in the past can be presented objectively to senior administrators by the facilities assessment. Team Specialists. The facilities assessment will enable consulting architects, engineers, and other specialists to gather data on building and infrastructure systems and components related to their disciplines. The information needs of the entire facilities team can be identified and used with more objectivity with the assessment data; this information should make it easier to study the overall building and infrastructure needs of the institution and incorporating them into capital renewal and new capital projects. Circumstances may differ between institutions that undertake a comprehensive survey of all facilities for the first time and those that have a specific set of goals for determining existing conditions. The basic principles presented here can be used for all levels of institutions, for a single structure, or for an institution's entire space inventory. Facilities managers should incorporate the special characteristics of the institution and its facilities into an individualized facilities condition assessment. To be successful, a facilities condition assessment program requires the support and involvement of senior administrators to ensure the credibility of findings and conclusions, thus enhancing the probability that financial resources will be allocated. This important factor in acceptance or rejection of a costly and time-consuming assessment process hinges on understanding the process and preparing for funding approval of a major capital expenditure program. Careful design of a facilities condition assessment enables the facilities manager to determine the level of information to be obtained and to ensure that it is appropriate for the intended application of findings and conclusions. The approach selected must be driven by the nature of an organization's facilities, budgeting methods, and organizational structure. Formats for reporting assessment findings should be tailored to match the input requirements for the maintenance work order system and the capital budgeting and planning processes. The assessment process can be conducted as a self-evaluation program using in-house staff or by consultants, or by a combination of both. Although a self-evaluation program may produce valued results, external consultants add credibility to the assessment. For this reason, the institution must weigh the value of engaging outside consultants against conducting an assessment using only in-house staff. As the facilities manager and staff gain experience with the assessment process, they will recognize the potential benefits to becoming familiar with building and infrastructure conditions, documenting observations for maintenance planning, and planning for capital projects. The assessment process contributes to the overall effectiveness of the facilities management organization by ensuring that condition inspections are a routine part of operating activities. Assessment process phases are shown in figure 1. The first three phases (Designing the Assessment, Collecting Data, and Summarizing the Results) provide the data on maintenance deficiencies and functional performance. This assessment is followed by a presentation of findings. In this systematic approach to a facilities condition assessment, the scope is first determined, the assessment team is selected, and the inspection is planned. Next, data are collected through building and infrastructure inspections and functional performance evaluations. Finally, the information from these inspections and evaluations is summarized, priorities are set, and results are presented. Conducting a physical condition assessment requires a clear set of objectives before committing staff and financial resources. Whether a campus has previously conducted a condition assessment or is beginning one for the first time, thorough preparation is needed to ensure understanding and support of all staff involved in the process. Management and inspectors must collect reliable data, identifying deficiencies as objectively as possible. A condition assessment can be comprehensive, collecting information on building and infrastructure subsystems and functional performance for all facilities; limited to a functional area, such as housing or athletic facilities; or selective for specific building subsystems, such as roofs; or specialized for safety or new regulatory requirements. A baseline survey of all facilities and routine updating via a computerized maintenance management systems supplemented by a third party survey at 3-5 year intervals is considered a best practice. A hallmark of a successful assessment program is the introduction of a culture of observing and reporting conditions, not on a one-time basis, but as a regular part of supervisory and trades activities. Inspection planning includes this process of continually observing and reporting deficiencies, and flowing results into maintenance work and capital project planning. Building and infrastructure inspections represent a significant commitment of resources. The assessment design should be prepared to adjust staff schedules for in-house inspectors and allow adequate time for managing consultants when they are used. Direct costs must be budgeted for reproducing plans, preparing building histories, performing laboratory testing, and producing other information. If consultants are used, their costs must be budgeted as well. Thorough preparation for application of findings, including staff training, will ensure the usefulness of facilities assessment results. Finally, an overall completion date for finishing inspections and assessing results should be factored into the scope to ensure timely presentation of accurate reports. Thorough planning of inspections enables observed deficiencies and costs for corrective measures to flow directly into maintenance work orders and capital project planning. Goals and objectives can include determining a project cost threshold for major and minor maintenance, evaluating deferred maintenance reduction programs, prioritizing capital project guidelines, and providing cost estimates and schedules for capital renewal or replacement and renovation projects. The choice of specific facilities to be inspected depends on the assessment's goals and often is influenced by deadlines, available resources (staff and budgets), building access, and seasonal conditions. Preferably, the facilities condition assessment is repeated on an average three-year cycle. Although all facilities can be included, the assessment can be omitted for buildings in temporary use; buildings below a size threshold (say 5,000 gross square feet); or nonessential campus structures. Unique facilities with special structural systems or a high level of public use, such as arenas, performing arts complexes, or convocation centers, may warrant inspections at more frequent intervals. In practice, institutions with a comprehensive baseline of conditions can compile information on a "rolling" basis with updated information entered periodically. Once the assessment scope has been determined, the team leader and team members are selected. An assessment team leader should be identified to guide the process from start to finish, supervise database preparation, select team members, schedule the assessment, assign team members, monitor progress, and report findings and recommendations. The team leader should be able to prepare written reports, skilled in inspection techniques, capable of estimating and planning, knowledgeable of maintenance practices and standards, and have good oral communication skills. The number of physical condition assessment team members and qualifications vary with the amount of space and complexity of building and infrastructure to be inspected. Team members can include architects as well as structural, mechanical, and electrical engineers. Complex inspections can require landscape architects and specialists, for example, in code requirements and conveying equipment. A familiarity with facilities operations and maintenance (O&M) procedures is useful to ensure that inspections and assessments encompass the practical aspects needed for work orders and capital projects. Knowledge and skills in installation and maintenance of a subsystem are important when selecting an inspector and evaluating the qualifications of a consulting team. The choice to use in-house staff or consultants has advantages and disadvantages. In-house personnel are most familiar with the facilities to be inspected. Maintenance supervisors or facilities planning staff that work with facilities on a routine basis have access to O&M information and can readily use existing knowledge of deficiencies. However, the conflict of performing current assignments often places in-house staff in the role of part-time inspectors who must defer inspection assignments or interrupt scheduled tasks. Thorough training of in-house staff can overcome the lack of inspection experience, provide uniformity and consistency of inspections, and contribute to the success of an assessment. Training should be conducted formally and should cover the inspector's role and importance of the inspection, completion of forms and use of results, and inspection techniques. Consultants are recommended when in-house staff are unavailable for inspection assignments. Advantages include completion of a physical condition assessment on a timely basis and objective inspections and reports. Consultants leave in-house staff free to perform their regular assignments. Consultants can offer specialized technical knowledge for diagnosing problems, recommend corrective measures, and estimate maintenance and capital projects. In developing and evaluating a Request for Proposal consider consultant experience as a contributing factor to credibility of FCA reports. The assessment scope must be carefully defined and monitored to manage costs and ensure that results meet goals and objectives. Consultants' work should be organized to ensure that future assessments can follow a similar format, providing data that can be used for comparison in future inspections. Special studies previously completed by institution, e.g., handicapped accessibility, hazardous materials, etc. Assembling the information into a relational database provides access to collected information and findings for maintenance planning and other purposes. Data may include a description of findings from inspections and other sources, preliminary prioritization of remedial work, and estimated costs. Thorough planning of the building and infrastructure subsystem physical condition inspections is essential to produce accurate, timely, and useful results. Several critical condition inspection factors pertain to scheduling inspections, inspection assignments, training, tools and equipment, notification to building occupants, and emergency work. Staff involvement. Regardless of the inspection team structure of in-house team or third party or combination of both, in-house maintenance and planning, design, and construction staff should be aware of the process, provide documentation as required, assist in inspections, and review and comment on draft reports. Scheduling Inspections. Inspection schedules are determined by the overall inspection timetable; the number of facilities, their size and age, and the type of facilities to be inspected; staff availability; facility access influenced by usage and seasonal weather; and the nature and extent of involvement with key building personnel. Inspection Assignments. Assignments for in-house inspectors or consultants are made by the assessment team manager. Disciplines should be matched with the inspection assignment. For example, primary systems inspectors could include a team with architectural, structural, mechanical, and electrical engineering skills. Two or more staff members should inspect a facility together to ensure safety and to improve communications between inspectors (i.e., identifying and diagnosing problems, selecting priority classifications, and estimating costs). Training. Training in-house inspectors and consultants as to the inspection's purpose and schedule and proper use of data entry methods is essential to ensure uniform and accurate results. Knowing why, when, and how the assessment is to be conducted contributes to the quality of inspection results and develops interest and enthusiasm for incorporating inspections into regular plant activities and for reporting maintenance deficiencies. The facilities manager should recognize that staff may consider assessments to be an added burden to their normal assignments. The leadership of the facilities management department and the assessment manager should impress on the inspectors the importance of their tasks and their contribution to the overall organization's operation and mission. Tools and Equipment. An efficiently performed inspection requires inspectors to be prepared for a day in the field without returning to the base of operations unnecessarily. Generally included items include floor plans and inspection documentation equipment, hand tools to enable access to equipment, a digital camera, and a tape recorder (optional). Guidance is necessary by experienced in-house staff for third party assessment teams to ensure safety practices are met and compliance is met for all regulatory requirements. Notification to Building Occupants. Building occupants should be notified before a scheduled inspection. A preliminary discussion with users or a survey soliciting information can identify many problems before the inspection. Access to the building or any planned service disruptions for testing should be coordinated to avoid interrupting normal operations. Inspection tours conducted while a building is occupied can uncover deficiencies and identify possible corrective measures. Care should be taken to avoid implying that inspections and identification of deficiencies will result in a specific program of remedial actions. Inspection results and any management actions should be shared with building managers. Emergency Work. Procedures should be in place for promptly remedying any emergency conditions observed during the inspection. Assessment team members should be instructed in these procedures during training. The condition inspection of a facilities assessment includes a visual inspection and record of observations of buildings and infrastructure systems and subsystems. The design of the inspection and data entry methodology followed are based on how a building or infrastructure is constructed and how inspectors would logically proceed to make observations, collect data on deficiencies, and determine costs of corrective measures. Building inspections begin with how a structure is placed in the ground; travel upward to structural framing, exterior envelope including wall and roof; and then move to the interiors. Each subsystem of heating, ventilation, and air conditioning (HVAC), plumbing, and electrical is inspected separately. A comprehensive physical condition assessment provides an inspection of the architectural, civil and structural, mechanical, electrical, and safety components of each facility. Infrastructure inspections are conducted in a similar methodical manner. Data collection is based on the taxonomy of building assembly by systems in UNIFORMAT II for Building Elements. Classifications provide a commonly used outline for data collection and permit comparison between institutions, including Level 1-Major Group Element; Level 2-Group Elements; and Level-3 Individual Elements. Figures 2 and 3 illustrate the Level 1 and Level 2 Group Elements for building and infrastructure. Source: U.S. Department of Commerce, National Institute of Standards and Technology. UNIFORMATII Elemental Classification for Building Specifications, Cost Estimating, and Cost Analysis. Washington, DC: U.S. Department of Commerce, 1999. A functionality assessment expands the traditional assessment limited to only physical condition to evaluate how well facilities are functioning for an assigned program. Although reference to a comprehensive approach combining physical condition and functionality appears in the facilities literature, application of the concept is, by far, the exception, rather than the rule. The functionality assessment answers the question: How well does the existing space meet contemporary functionality needs for the program it is supposed to serve? What remedial actions, including renovation or modernization upgrades, can improve functionality? The functionality assessment has a different focus than the physical condition assessment, and it takes into account factors of programmatic uses and requirements. The approach is not building system-based. It is directed toward the perspective of the building user, and it is based on data collected from an evaluation of user interviews and a set of functionality criteria relating to performance features of space. This assessment is done by space type (e.g., classrooms, teaching laboratories, research laboratories), rather than by building systems. Assessment team skills include experience and knowledge about pedagogy, state-of-the-art space configuration and equipment to fit specific programmatic needs, and technical space requirements. For example, the assessment team must be proficient in evaluating a room designated for Chemistry 101 and determine whether it meets functionality criteria standards for contemporary purposes. Some issues surfacing in functionality interviews about the amount of space available, configuration, adjacency, appearance, security, and space comfort actually may be due to dissatisfaction with physical conditions, or may be the result of users' preferences. In sorting out these sensitive issues -- some real and some perceived -- the interviewees' opinion of the evaluator's qualifications must pass the test of credibility to gain confidence in final conclusions and recommendations. Perceived interviewer shortcomings can be supported by including a senior academic administrative officer as an interview participant. The functionality assessment is tailored to the specific size and complexity of an institution. Assessment methodology enters the realm of objective analysis of quantifiable needs and subjective evaluation of "wish lists" obtained through field observations and group interviews. The information-gathering process is delicate because of the challenge to distinguish justifiable needs identified by space users that are potential "real" capital projects versus personal preference for unrealistic goals. Interview practice works well with a leader to focus on issues related to the interviewee's program or department space and a second person to assist in the discussion and serve as a note-taker. Interview notes should be recorded as accurately as possible and a transcript submitted to attending interviewees for comment. The final meeting notes are revised, as appropriate, and published as part of an interim report. Evaluation comments and notes, with ratings, are used to calculate a project cost based on a judgment of the required scope of work. A cost template is developed with estimates for unit prices per square foot for similar spaces or for the entire modernization of an existing space. 1. Functional adequacy Classroom configuration and the size and arrangement of student and instructional stations satisfies instructional requirements, and provides adequate sight lines. 2. Accessibility Spaces shall meet ADA standards wherever required to meet program accessibility requirements. 3. Room finishes Floors shall be covered in an appropriate, easily cleaned material that will permit the room to be maintained in a neat and orderly condition. Walls and ceilings shall be finished in appropriate, easily cleaned materials. Color schemes and finish materials shall present a pleasing appearance conducive to teaching and learning. 4. Acoustics and sound control Floor covering, wall surface, and ceiling materials shall have appropriate sound absorption and reflective qualities, and insulation against outside noise shall be sufficient to provide a teaching, learning, study, or work environment free of distracting noise levels. 5. Climate control Heating and cooling systems, together with adequate control systems, shall be installed that will permit the maintenance of a comfortable teaching, learning, study, or work environment at all seasons of the year. 6. Lighting The installed lighting system shall provide an adequate quality and level of lighting for the teaching, learning, study, or work environment, and shall be provided with controls to vary or adjust the lighting level as required for specific needs. Appropriate classroom window coverings shall be provided to permit unimpaired use of A/V or other teaching equipment. 7. Electrical service Adequate electrical capacity and outlets shall be provided in the room to accommodate teaching equipment, laptop computers, office equipment, etc. 9. Furniture and fixtures Classroom fixed seating, when installed, shall be ergonomically correct, maintainable, provided with adequate tablet arms or table space for note-taking, and shall provide an unobstructed view. 10. Information technology All office spaces shall have appropriate connectivity to campus data networks and the Internet. 11. Storage space An adequate amount of storage space for equipment and files appropriate to the function shall be provided. Source: Used with permission. Kaiser, Harvey H. and Klein, Eva. Strategic Capital Development. APPA: Alexandria, Virginia, 2009. A physical condition assessment based on field inspections (or combined with a life-cycle forecast model) and a functionality assessment provide a comprehensive picture of capital improvement needs for each facility evaluated. Functionality findings added to condition and code findings can provide total project costs. For example, a condition assessment estimating $2 million of building system and code corrections including a new roof, exterior masonry painting, HVAC system upgrades, and so on is combined with a functionality review yielding another $2 million of interior space reconfiguration, for a total project need of $4 million. In other cases, the findings of the functionality assessment may override a condition assessment project. For example, a condition assessment may find that some number of light fixtures in a series of classrooms are broken and require replacement. The functionality assessment may conclude that the entire lighting system is inappropriate for modern classroom requirements and may propose complete replacement of the lighting system. In such an event the broken fixture replacement would be replaced by a new lighting system project. The combined assessment findings can determine a policy decision for a building renovation or replacement by answering the critical questions: Is the facility suitable for its current use, or will it require major renovations and/or modernization upgrading? What is the actual cost of remodeling compared with a new building, and is relocation of programs to another building feasible and desirable? For example, as a result of condition inspections, a building may be found to have significant physical condition and functional deficiencies, with costs of corrective measures exceeding replacement value. However, for historic, aesthetic, or other reasons, the building may be desirable for renovation and extended use. Major renovations resulting from the functionality assessment may include all identified priorities in a single capital project. In contrast, a facility may be considered for remodeling, but the institution may want to recommend demolition because of conflicts with plans for future land use or sale as a source of revenues. After completing data collection, the next steps in the facilities condition assessment process are to (1) evaluate the assessment process, (2) create a database of assessment findings, (3) metrics for performance measures of year-to-year changes in building and infrastructure conditions and comparability with peer institutions, (4) update assessments, and (5) design reports to be produced from the database. Assessment findings and conclusions provide a resource for assembling a Web-based relational facilities database. 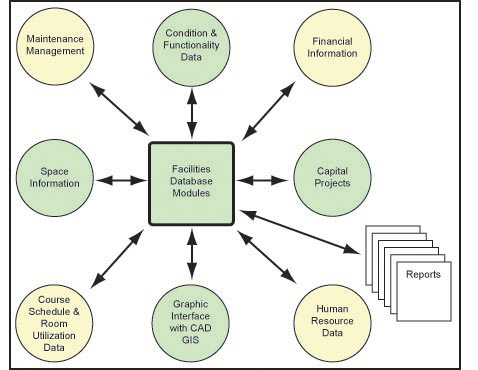 Figure 5 illustrates the various modules residing in the database, including modules for space information, maintenance management, project management, financial information, capital projects, human resource data, and graphic interfaces. Policies and procedures for assessment updating are necessary to ensure the viability of data and information for knowledge-based facilities decision making at policy and operational levels. Candidates for updating dynamic information generally are in the form of data and information collected as inputs and findings generated by condition and functionality assessments. For example, space inventory changes recorded as the result of new construction or renovations are fed into the database and accessible for users. A cooperative venture between an institutional information technology department and facilities management for database maintenance is a common technique to coordinate protocols for data management, security, and software updates. A metric for measuring a campus adequacy and suitability of facilities is calculated by dividing the cost of remedying deficiencies by current replacement value (CRV). This formula produces the metric of a Facilities Condition Index (FCI = $ / CRV). Commonly used throughout higher education as a measure of comparability between institutions reliability is questioned by variations in institutional definitions of components of the formula and problems with uniformity of data collection and inputs. For example, “deficiencies” is expanded from urgent unfunded major maintenance to include capital renewal several years into the future and inconsistently including project costs for renovations to satisfy functional needs. Another example is in calculating “Current Replacement Value” in a manner consistent for comparable institutions as the total cost of replacing a facility to meet current requirements. A modification in the factor for “cost of deficiency” in a metric is to include cost of meeting functional needs in a Facilities Quality Index (FQI), sometimes called a Facility Condition Needs Index (FCNI). This metric accurately reflects an institution’s financial needs for total capital renewal that includes physical condition and functional needs. Thus the metric is FQI = $ Physical Conditions + $ Functiuonal Needs / CRV. Similar to database maintenance, policies and procedures should be established to extend the life of assessment data and information findings and conclusions. Some data and information are less dynamic than others (e.g. space inventory, construction and major renovation dates, etc. ); monthly, quarterly, and annual updates can be prioritized for maintaining a facilities database. Policies and procedures for assessments should be managed and implemented by the facilities management organization or, in the case of outsourced program management, by consultant(s). Basic data elements are updated annually or driven by specific information requests, such as a decision-making review of a capital project. Facilities condition assessment data should be updated on a regular basis for reliability and user confidence in timeliness of data. The outcomes / deliverables of a facilities condition assessment are an Executive Summary and a set of detailed reports maintained online as a comprehensive. Using building and infrastructure assessment results, reports may offer information on the overall condition and functionality of a facility type, such as academic space or student housing, or an individual facility and its subsystems. Further sorting of data provides performance metrics of a Facilities Quality Index and identification of projects by condition and functionality, priority, and project cost. Reports can be designed for presentations for different purposes and are limited only by the needs determined as appropriate to an audience. Summary reports should be more than facts and figures. An executive summary provides an overview and highlights of findings. A narrative describes the assessment process and objectives, priority selection criteria, and list of projects. Assessment summaries can be organized in several ways: by all facilities, by individual facilities, by all building systems, or by individual building subsystems; and by all building components or by individual building components. The final phase in the facilities condition assessment process is presenting findings and putting the assessment to work. The facilities condition assessment is one of the most valuable tools available to help facilities management perform its responsibilities, if the assessment is developed and presented well. Even a flawlessly performed assessment is useless unless the information can be communicated to audiences in a readily understandable format. Careful consideration should be given to the audience, its interests, its knowledge of the subject, and the issues it faces as a decision-making group. In all cases, the chief facilities officer should provide material that is concise, easily understandable, and attractively presented. The information should be free of jargon, confusing terms, or acronyms that are not self-explanatory. Do not oversimplify for readability, but do design the documents for ease of cross-referencing. Material should be developed in anticipation of the institution's sharpest minds receiving the information. The documentation must be meticulous in detail and accuracy. Simple arithmetic errors and broad generalizations should be avoided by thoroughly checking all financial data, priority selections, and cost-benefit analyses. Credibility is strengthened by rigorous review of data collection methodology, analyses and findings. Expect the unexpected. Be prepared to answer the question: What will happen if we postpone or don't do the work at all? The documentation provided by a facilities condition assessment will have lasting interest because of its impact on campus physical environment and financial matters. Thorough preparation is necessary in the design of materials and presentations to establish and maintain the credibility of facilities management and the reliability of its information. Before beginning the assessment process, consider the presentation format. The wide array of summaries available from the assessments should focus on priorities and costs, with supporting material keyed to condensed presentations. If the report of physical condition and functionality findings and conclusions is to be submitted in print form only, without an oral presentation, consider what graphic material would be helpful. The report may be presented as a brief statement of facts with graphics or as an extensive narrative that includes background, description of methodology, findings, and conclusions. Overview. Does the assessment show a broad understanding of the institutional budget process and present a responsible fiscal position? Do the conclusions and recommendations fit into long-term policies and overall goals? Credibility. Does the assessment show that previously allocated funds were well used? Does it take the initiative for the best use of new resources for new programs? Competency. Did the assessment team appear professional and competent during the process and in follow-up activities? Thoroughness of Preparation. Was the assessment thoroughly researched and analyzed and professionally presented? Was there evidence of collaboration with budget managers and facility users in the preparation of findings and conclusions? The form and content of the presentation must be an accurate presentation of the facts—objective, consistent, and capable of withstanding thorough scrutiny. Supportive Senior Administrator. The budgetary allocation process represents competition for limited financial resources. Without a strong advocate, the facilities condition assessment conclusions may be shelved. A senior administrator who understands the assessment, its findings, and conclusions is an invaluable ally in the funding and implementation process. Preparation for Implementation. The assessment conclusions must be in an immediately usable format for project planning and implementation. Administrators who will be involved in the implementation process should be included in the formulating of conclusions. Operational staff should be involved when possible. These contributors improve the end result and ensure that the purpose of the assessment is clear to all parties. Putting the assessment to work means developing an ethic among maintenance staff to continually inspect, observe, and report deficiencies, and maintaining a timely and accurate record of facilities conditions. It also means developing funding alternatives, establishing procedures for program management, and ensuring that the current use of resources is effective and efficient. The facilities condition assessment process provides the basis for determining capital needs to correct current problems and to avoid future facilities deterioration. This process enables the development of short-term and long-term needs for dealing with problems. Too often, at this point, the process ends in frustration, with senior administrators or the governing board denying or deferring decisions on funding requests. Although the number of successful examples is increasing, the evidence from national surveys shows that the rate of facilities deterioration continues to increase. Despite declining public support and financial distress in higher education, the facilities condition problem must be faced sooner rather than later. 1. UNIFORMAT II October 1999. "Elemental Classification for Building Specifications, Cost Estimating, and Cost Analysis." NISTIR 6389. Washington, DC: Department of Commerce, National Institute of Standards and Technology.